Michael Rennie stars as Harry Lime, international business tycoon and trouble-shooting private detective. Jonathan Harris co-stars as Lime’s assistant. The Third Man was filmed on location in Europe. As with many old tv shows The Third Man had it’s beginnings on radio. Year: 1959 – BW – Runtime: 550 – 4 DVD Set. THE THIRD MAN EPISODE TITLES: Confessions of an Honest Man, Sparks From a Dead Fire, The Man Who Died Twice, The Angry Young Man, Dark Island, The Third Medallion, Castle in Spain, How to Buy a Country, The Best Policy, Three Dancing Turtles, Harry Lime and the King, A Calculated Risk, A Diamond in the Rough, Portrait of Harry, Ghost Town, Gold Napoleons, A Question in Ice, I.O.U, A Crisis in Crocodiles, A Little Knowledge, Frame-Up, House of Bon Bonz. 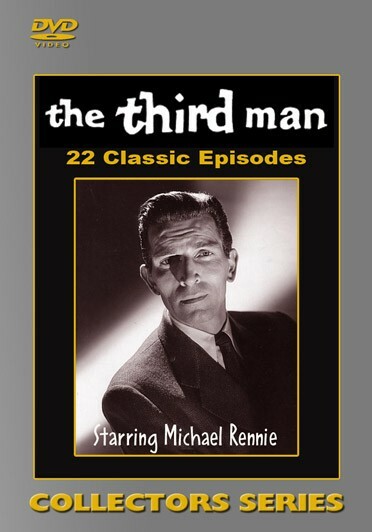 Very nice collection The Third Man rare classic TV shows starring Michael Rennie. Michael Rennie is most famous for his starring role in The Day the Earth Stood Still, a classic 1951 science fiction movie.